The Reagan administration started in 1981 and lasted until 1989. This period of 8 years consists of the first few years with very high interest rates and the rest with continuous rate cuts. Throughout the period, though, the administration was eager to expand the budget deficit by cutting taxes and investment. This experiment shows if the loose fiscal policy of Reaganomics could work to support the US economy against high interest rates, or it failed and needed financial easing. We review this with data. When Ronald Reagan became the President of the US, the economy was suffering from the stagflation. Inflation was booming, whilst the economic growth was far from sufficient to alleviate the rising prices. The federal funds rates were around 19% and remained high for a few years. To stimulate the stagnant economy, President Reagan decided tax cuts. He also promised to commit to improve the budget deficit, but on the rise of the communist forces around the world, he in fact invested enormously in the military. 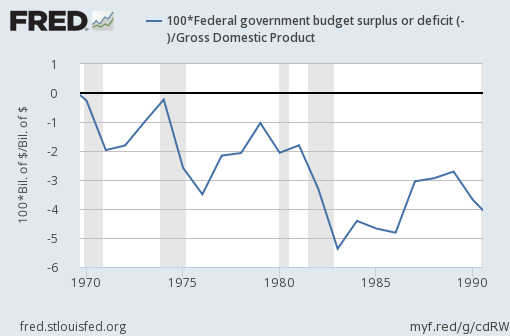 The budget deficit is important because it affects interest rates. When a tax increase is not a choice, if the balance is negative, the government has to issue bonds to borrow money. With the more bonds issued, which means more supply for the bond market, the bond prices dramatically went down. As a low bond price means a high yield, long-term interest rates hiked. The following is the real yield of 10-year Treasury notes. 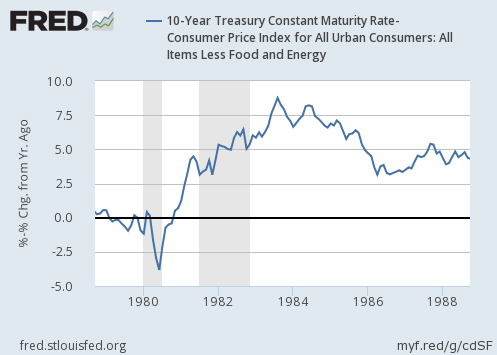 The graph shows the yield had obviously risen since the beginning of the Reagan administration in 1981. However, high interest rates are depressive for the economy. The question is whether or not the tax cuts and investment of Reaganomics could alleviate the negative effects of high rates. Unfortunately, the financial policy had a stronger influence on the economy than the fiscal policy. As a result of high rates and tax cuts & investment, the US economy went into a recession on the second year of Reaganomics, 1982. 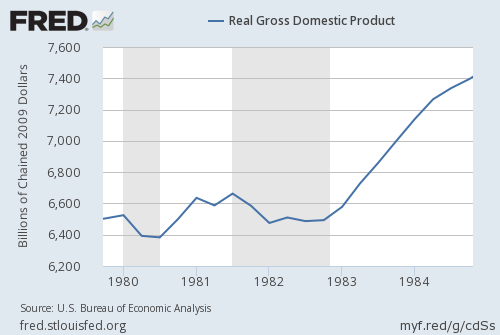 The following is the chart of the GDP. Yet, the economy started to grow afterwards. What happened? 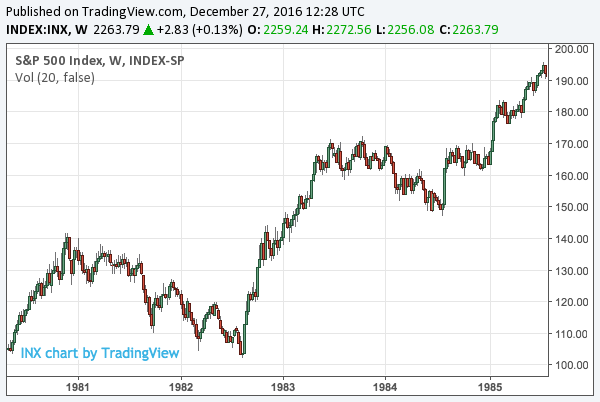 In 1982, the Fed judged that it had succeeded in cooling down the inflation with high interest rates and thus decided to start cutting rates. 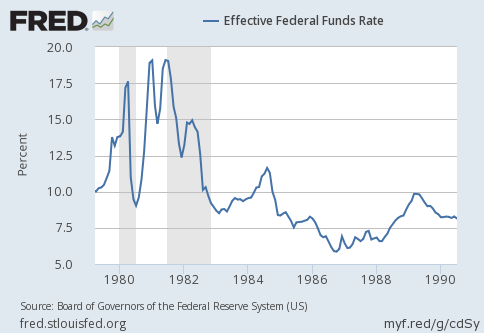 The following is the chart of the federal funds rate. The chart also implies that the US stocks were in a bear market until the Fed started rate cuts, despite the tax cuts and investment of Reaganomics. The market went down more than 20%, and this performance is horrible considering the high inflation at that time. It means the real performance for the investors was even worse. In conclusion, Reaganomics failed to support the economy with a fiscal stimulus but without financial easing. This result of the experiment is significant for modern economics.